Oakville Infiniti | QX50 | INFINITI QX50 VS BMW X3: Which is Better? INFINITI QX50 VS BMW X3: Which is Better? 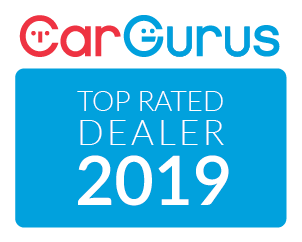 The compact luxury SUV segment is one of the fastest growing niches in the car game, with virtually every manufacturer offering their own version for prospective buyers. The 2019 INFINITI QX50 and 2018 BMW X3 often find themselves head-to-head, both loaded with amenities and outfitted with spacious interiors. We have put together a comparison list to help make choosing between these two SUVs a little easier. The 2019 QX50 is available in five trims – Luxe, Essential, Proactive, Sensory, and Autograph – and each model offers an all-wheel-drive version. The BMX X3 offers just two trim levels – X3 sDrive30i and X3 M40i. However, the X3 is also offered in an all-wheel-drive model – the X3 xDrive30i. The 2019 QX50 has the most cargo space in the segment with just over 1843 litres. You have 877 litres behind the rear seats to work with, as well. The BMW offers significantly less behind those rear seats (812 litres) which can make a big difference when it comes to carrying bigger items. Plus, with multiple kids and mouths to feed, groceries and backpacks can end up taking up a lot of space, fast. The 2019 INFINITI QX50 offers a standard 2.0-liter Variable Compression Turbo Engine which outputs 268 horsepower and delivers a monstrous 280 lb.-ft. of torque. Conversely, the BMW X3 delivers just 248 horsepower and 258 lb.-ft. of torque. The real game changer between these two SUVs is the engine itself. INFINITI has armed their product with the world’s first ever variable compression engine. Not only does the QX50 turbo V6 engine yield an unprecedented amount of power and control to the driver, it burns less fuel than a traditional engine like the one found in the X3. You essentially have two engines in your vehicle working together to improve fuel efficiency. It also delivers a maximum efficiency of 14:1 that reaches up to 7.8 L/100 km on the highway. 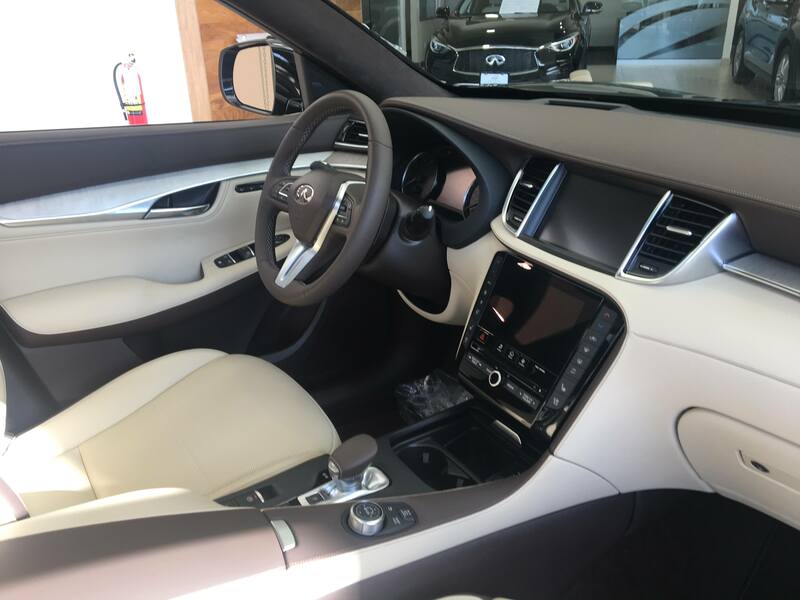 The 2019 INFINITI QX50 comes with a long list of standard luxury features including 19-inch aluminum-alloy wheels, all-season run-flat tires, and Emergency Braking and Pedestrian Detection. INFINITI has also included Intelligent Key with Push Button Start, a power liftgate and SiriusXM Travel. The 2018 BMW X3 comes with standard 18-inch wheels and non-automatic LED headlights. They do include automatic 3-zone climate control, rain-sensing windshield wipers and power windows, among others. Where the INFINITI really best the BMW, however, is in the technology department. Thanks to INFINITI InTouch and advanced driver assisted technologies such as Forward Emergency Braking with Pedestrian Detection, both not found in the BMW, your INFINITI is more far more advanced technically than the X3. And, while both SUVs offer a long list of standard safety features, the QX50 has introduced the INFINITI advanced Air Bag System which adjusts airbag inflation rates in real time. 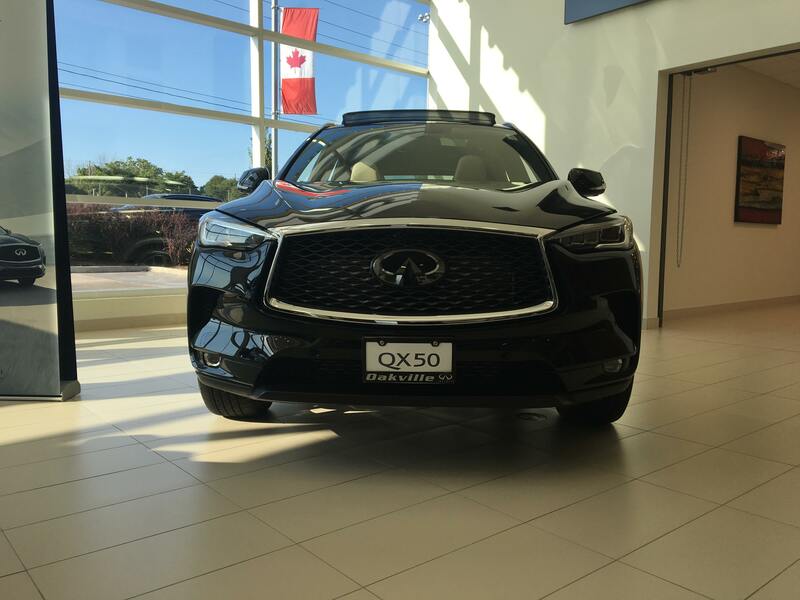 The 2019 QX50 is poised to be a favourite among Oakville, Burlington and Mississauga drivers alike. 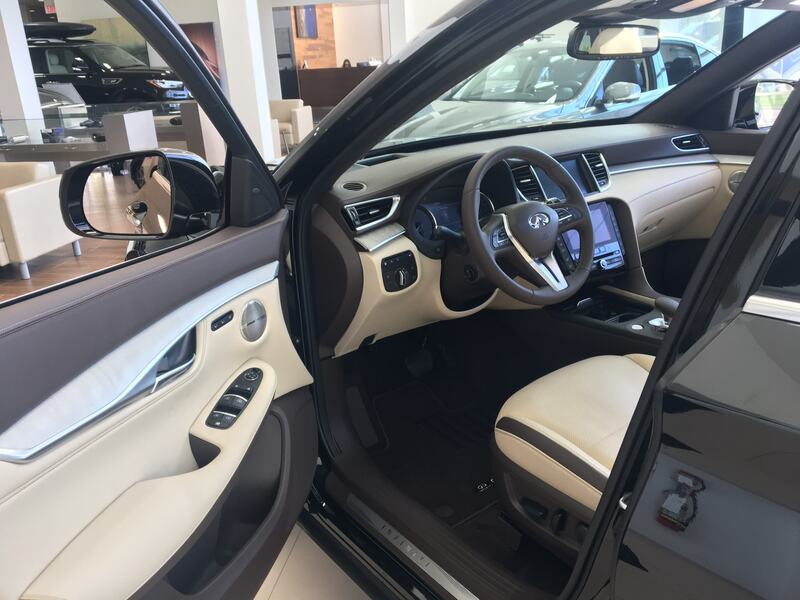 With leather-appointed seating and optional Maple Wood trim, the INFINITI interior stands out in the most remarkable way. Memory seats and mirrors come standard as does INFINITI InTouch™ with Navigation with upper 8” and lower 7” VGA LCD touchscreens. The Autograph is the highest line trim the QX50 and by far one of the most luxury SUVs you will step foot in. With white premium grade leather-appointed seating and soft-contrasting blue piping between white leather and blue Ultrasuede; it is a standout in the segment. Finally, the Bose® Premium Series 16 Speakers sound system delivers an unmatched level of sound quality not to be outdone by the BMW. Visit Oakville Infiniti today. We have customers across the GTA, including Mississauga, Burlington, and Oakville. Drop in for a test drive today and explore our competitive financing options. Want to know more about the standard features or upgrade packages? 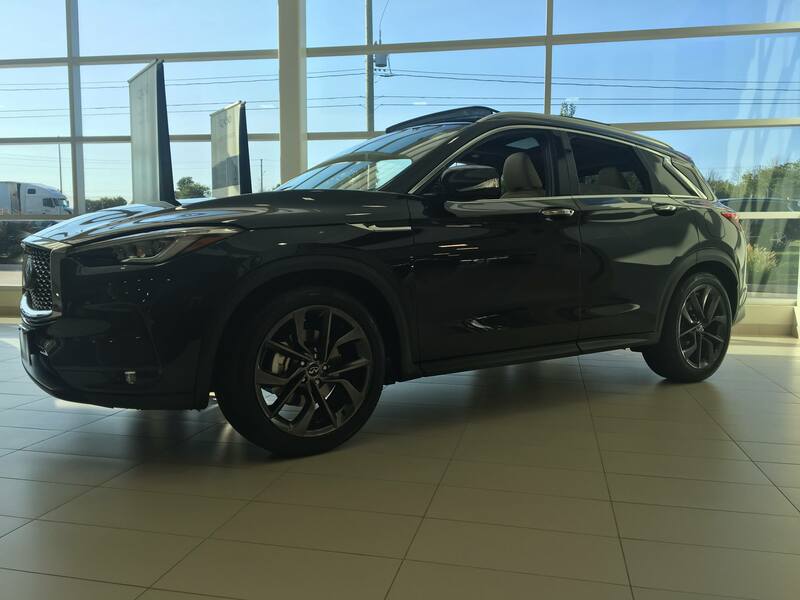 Book an appointment with one of our Sales Associates and we can walk you through the all-new 2019 QX50 today.